The Earful is a high powered, in your face, shake your booty machine that will funk you just right. 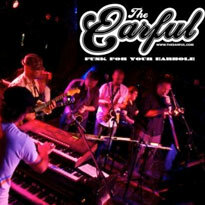 Formed in late 2008, The Earful touches on various styles of the funk in all of its forms and pays tribute to the masters. Having shared the stage with amazing talent such as Soulive, Level 42, Groundation, Orgone, The Aggrolites and Les Nubians, they bring a paint peeling, barn burning intensity that is unforgettable.The heavy sound of the Hammond Organ, the funky bass lines, and the stabbing brass hits of this 7 piece group are sure to get your rump bumpin&apos;. Click here for more information about The Earful.